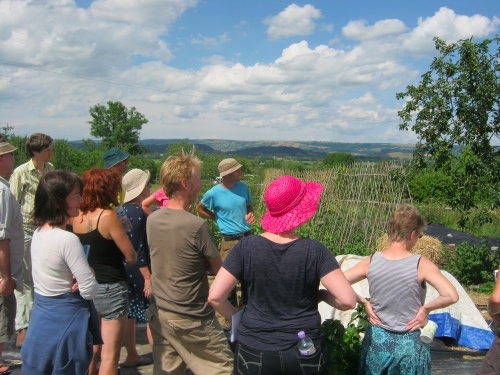 We recently held our Permaculture in Five Days course at Maiden Croft Farm, just outside our home town of Glastonbury in Somerset. One of the enterprises on the farm is the organic market garden, run by Rob Macbeath. As he showed us round I realised how thoroughly intergated the garden and the farm are, with a strong network of mutal links between the two. Links like this are an important aspect of permaculture. Rob shows us round the garden. 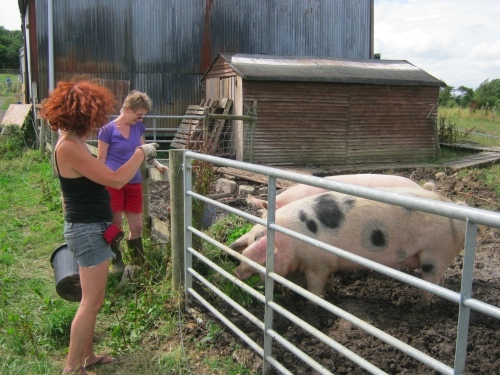 The farm, of some 40 acres (16ha), is owned by the Paddington Farm Trust and its main function is to give country holidays to inner city children, though it’s also open for camping and acommodation. Most of the land is grassland but at its heart lies the market garden which Rob, with his former business partner Colum Pawson, used to rent from the farm. But since Colum departed to pursue other interests Rob has forged closer links with the farm. Now the profits are split fifty-fifty, with Rob providing the management and skilled labour while the farm provides volunteer labour – it’s very much part of the local community and many people come to help. Rob also works as a part-time fireman, so he’s not totally dependent on what he grows for his income. You could say he has a polycultural income. We rent teaching space and accommodation from the farm and the tour of Rob’s garden is one of the highlights of the course. We also have a practical work session, where the course participants do a job which is fun with a mob of people but would be tedious with just a few. They really appreciate a spell of physical work to balance all the learning we pack into the five day course. This is just one of the mutually beneficial links between the farm’s business and the market garden. 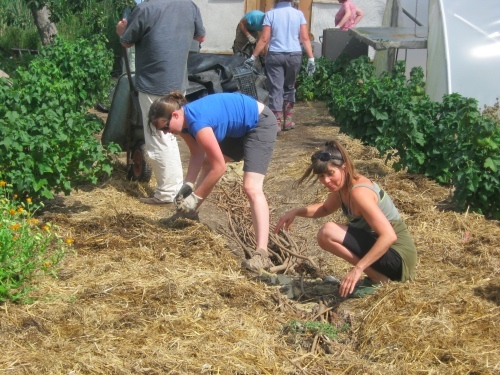 The practical task, as you would expect on a permaculture course, involved mulching! Fertility is another. Vegetable waste goes to the pigs, giving them a welcome bit of greenstuff in their diet, and manure comes back in return. Rainwater is harvested off the roof of the farm buildings, just uphill from the main garden, and water also comes from the farm well, making use of the natural supply of the landscape rather than tapping in to the mains. The pigs get their salad course. Another useful link is the farm shop, which is mainly patronised by campers and other visitors to the farm. It’s not a major outlet for Rob’s produce – most goes to his market stall and a wholefood co-op in the town – but it’s a welcome addition and it reduces food miles to food yards. He also supplies our course, and the satisfaction of knowing that what you’re eating was grown on site is a great attraction to people learning about permaculture. We’re not just talking about it, we’re putting it into practice. The garden is constantly changing as Rob refines the system to suit what works best for him. Everything is grown on beds and he’s found that the original 1.25m beds are too wide for easy work, so he’s gradually converting them to 1m. He’s also moving away from a focus on salad crops. 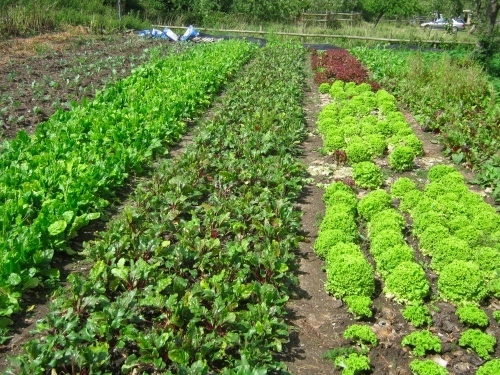 Most people growing vegetables by hand concentrate on salads, as they’re the most profitable thing to grow. They’re the one kind of crop which must be done by hand, so you’re not competing with people using tractors. One grower told me he had 10% of his land in salads but they provided 60% of his income. But Rob finds growing salads hard, boring work and only grows as much as he needs to keep a balanced supply for his outlets. He’s a relaxed, laid back gardener, usually seen with a smile on his face. The wider beds are productive, but not as ergonomic as they might be. Nevertheless he’s got on top of the weeds, which is no mean feat on this heavy soil. He also feels he’s got on top of the slugs and next year he plans to sow more crops direct into the ground rather than raising them in modules. Little plants coming up in the open are more vulnerable to slugs, but if he gets away with it he will save himself and the volunteers a whole lot of work. I look forward to seeing how well it works. To see more pictures of the garden, go to our facebook page, Patrick Whitefield Associates.